At eGreen Roofing Solutions, we use a time-tested approach to install fluid applied roofing systems. Don’t allow just any roofing company to install fluid applied roofing; when done incorrectly, a roof coating won’t offer the protection you are looking for and may actually do more harm than good. Our certified experts have decades of experience applying and maintaining liquid roofing membranes. We have specialized in fluid applied roofing systems since 1993 with millions of square feet of roof coating installed with a level of knowledge and expertise that sets us apart. Learn more about our process for installing fluid applied roofing systems for long-lasting results. Before a fluid applied roofing membrane can be applied to your roof, it must be thoroughly prepped for priming and waterproofing. While cleaning the roof may not seem like a major component of roof recovery, it’s one of the most essential. Unfortunately, many uncertified roofing companies do not take the time to properly prepare a roof & rush through roof coating application. This can lead to premature failure and insufficient waterproofing. Our certified technicians will begin with infrared moisture scans to make sure your existing roofing system does not have a hidden moisture problem. If your roofing system has hidden water issues, it may not be a good candidate for fluid applied roofing. Once we determine your substrate is suitable and dry, your roof will be thoroughly cleaned. 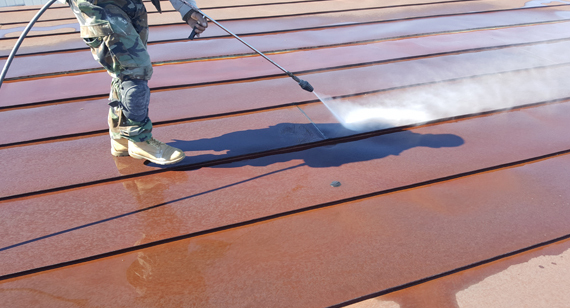 Without a proper cleaning job, the primer and roof coating won’t be applied to your roof substrate; it will be applied to sand and debris on the roof. A roof coating can’t stick well to dust, dirt, and oil that collects on the roof from asphalt, cars, and chimneys. When the wind and rain come, all of this hard work would be washed away. Once your roof is clean and dry, the appropriate primer will be applied based on what type of existing roof you have installed. A primer helps the roof coating adhere by creating a bond between the coating and the roof surface. While primers improve roof coating adhesion, a primer doesn’t replace proper roof preparation and cleaning. Even the best fluid applied roofing membrane will not prevent leaks if your roof has cracks or gaps. An essential step we take before applying your roof coating is waterproofing your roof. Our certified roofing experts will carefully inspect your roof and analyze the condition of your roof substrate. Any potential sources of leaks will be corrected. Careful consideration must be paid to penetrations like vents and pipes, the seams, and the flashing or metal edges. Once repairs are done, the roof is waterproofed and ready for a protective roof coating. Fluid applied roofing is the eco-friendly decision that isn’t just good for your business; it’s also good for the environment. Here’s what makes our liquid applied roofing solutions a smart green decision. Fluid applied roofing by eGreen extends the life of your roof by up to 10 years with each coating, helping the environment by avoiding unnecessary tear-off and roof disposal. Fluid applied roofing is the ultimate cool roof solution. A white roof coating reflects up to 90% of sunlight versus just 20% with a traditional black roof. A concentration of black roofs in an urban community can increase reduce temperatures by up to 15 degrees compared to suburban areas thanks to a “heat island effect.” According to the Department of Energy, white elastomeric roof coatings can improve the energy efficiency of your building by up to 50% to keep your building cool and reduce demand on your air conditioning system. A white cool roof can be up to 100 degrees Fahrenheit cooler than a traditional black roof. Choosing an Energy Star-rated fluid applied roofing system by eGreen can reduce this heat island effect while lowering your energy costs. In urban areas, white roof coatings can help reduce smog levels by keeping local temperatures cool. For every 1,000 square feet of white roofing that replaces non-reflective dark materials, there is a CO2 offset of 10 metric tons. Los Angeles has gone so far as to paint its streets white and require cool roofs on most new non-residential buildings to reduce smog levels and reduce the urban heat island effect.